Phase One, the world’s leading manufacturer of high-end digital camera systems, today released Capture One 12, the next major milestone in the evolution of the industry’s premier RAW conversion, image editing, and asset management software. This release takes a top-down approach to streamline, modernizing, and improving the user interface to continue the program’s tradition of providing powerful features in a customizable, uniquely- configurable interface. Capture One 12 introduces a newly re-designed, contemporary interface, designed to make Capture One easier to use during long editing sessions and to make discovery, experimentation, and customizability easier than ever. New iconography better conveys tool functionality, and the new slider design, the spacing of the tools, and font size increase improves both the look and the usability of the program. The result is a new environment that feels more welcoming for new users while being more customizable for power-users. Users of Capture One will be able to extend the platform with the upcoming addition of plug-ins that allow for sharing, editing, and that can connect Capture One to a variety of specialized editing tools. For developers, the Capture One Plugin SDK—available as a free download—will provide access to the broad base of passionate professional and enthusiast photographers that use Capture One. 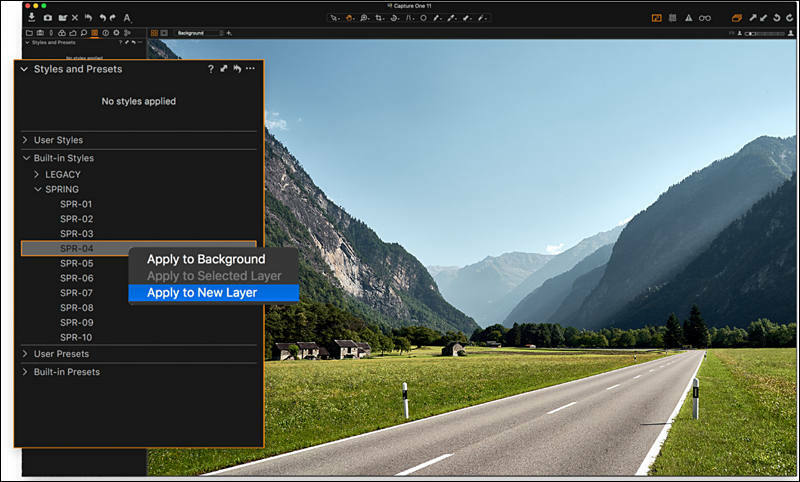 Developers are now able to create solutions that leverage the image-editing and organizational prowess of Capture One, and the added capabilities of third-party resources. Phase One carefully evaluates and interprets each camera’s RAW formats, allowing Capture One to present images with the utmost fidelity, often bringing out nuances that other programs can’t even perceive. In addition to the RAW support for more than 500 cameras, Capture One also provides profiling and image correction support for more than 500 lenses. Like with the RAW file interpretation, Phase One carefully measures the optical characteristics of each supported lens and builds correction algorithms that compensate for the various optical imperfections of various designs. As a result, Capture One can correct for numerous common optical issues such as vignette, and chromatic aberration as needed for each of the supported lenses. COPENHAGEN, Apr. 19, 2018 -- Phase One, the world's leading manufacturer of high-end digital camera systems, today released Capture One 11.1, a feature release to the industry's premier RAW conversion and image editing software. The release enhances the Capture One user experience, through a new support platform and functionality updates to ensure a faster, smoother workflow. Improved Styles and presets workflow, support for 11 new cameras, including Sony A7 Mk III and Fuji X-H1 and 10 new lenses, including Tamron lenses for both Nikon and Canon, and an all-new Resource Hub are among the latest updates. "Capture One remains dedicated to the needs of ambitious photographers. These latest updates introduce an extension to camera and lens support, as well as an all-new Resource Hub. The Resource Hub is an in-app portal that allows users to easily access news, tutorials, updates and much more -- all designed to inspire photographers and ensure the best workflow and user experience in Capture One,"said Jan Hyldebrandt-Larsen, VP Software Business at Phase One. A new workflow adds a much faster way to apply both Styles and Presets to a Layer on one or multiple images, offering a direct control of opacity, imperative to wedding and portrait photographers. Furthermore, a new Spring Styles Pack is included, offering bright pastel color grading to images, particularly helpful to wedding, portrait and landscape photography. The Resource Hub has been introduced to offer quick access to free learning resources via a dynamic on-screen portal. Tutorials, news, webinars, blog posts and much more are offered in one convenient location to improve the user experience and learning curve with Capture One. The normalization tool provides a reference point for exposure and white balance for batch adjustments, now allowing any color to be used when previously the only option was a neutral grey. Capture One 11.1 is available now for the Mac and Windows operating systems online at www.phaseone.com/store and from Phase One authorized partners worldwide www.phaseone.com/partners. Owners of Capture One Pro 11 perpetual and subscribers can update for free by downloading. New customers can purchase Capture One Pro 11 for 299 USD or 279 EUR. Capture One Pro 11 is also available by subscription. A single-user subscription is 20 USD/EUR per month for a 12-month plan or a 180 USD/EUR prepaid subscription, paid annually. Owners of Capture One Pro Sony 11 can upgrade for free by downloading. New customers can purchase Capture One Pro Sony 11 for 79 USD/EUR. Owners of Capture One Pro Sony 9 and 10 can upgrade for 69 USD/EUR. Please see all products and payment options at www.phaseone.com/store. Now that is hidden! Why not put that in the press release????!!! Any CUDA, or OpenCL acceleration? Working with 1000's of raw files it can make a difference. Phase One, the world’s leading manufacturer of high-end digital camera systems, today released Capture One 11, a major new version of the industry’s premier RAW conversion and image editing software. This release builds on Capture One’s unmatched color handling, precision-editing tools, seamless tethered support, and native support for more than 400 different camera models. Photographers will enjoy new, highly responsive tools, workflow enhancements and a finely tuned processing engine. Capture One 11 has been designed to deliver a significantly faster and smoother experience. Layers have been significantly improved for faster, more flexible editing. All adjustment tools in Capture One are now compatible with Layers, making Capture One a truly “layer centric” application. Furthermore, images can now be annotated in Capture One (handwritten notes and drawings can be added directly on to images) and included in exported PSD files as a separate layer for greater flexibility. Re-engineered tools help optimize color adjustments. Plus, more robust catalog performance improves the overall experience. In response to customers’ needs, masking tools have been further developed, and new features and overall performance advances have been introduced. New tools have been added to refine and feather the mask after drawing, or adjust the opacity of a layer to control the impact of local adjustments. With more tools available locally and with increased performance in masking, Layers in Capture One are now more dynamic than ever. Annotations and graphics as Overlays can be added to images and exported in PSD files as separate layers. Crops can be respected or added as a Path when exporting to PSD files, permitting the full image to be used later for retouching. An individual watermark may be included as a separate layer in an exported PSD file to permit greater control during later editing. Capture One has been further optimized to increase overall performance. Improved color handling through re-engineered color tools helps ensure optimal layered color adjustments. Color readouts can now be viewed in LAB mode aiding customers who wish to measure image output to critical values. Improved performance in Catalogs makes for an overall better experience. Capture One 11 is available now for the Mac and Windows operating systems online at www.phaseone.com/store and from Phase One authorized partners worldwide www.phaseone.com/partners. In keeping with Phase One’s commitment to its customers’ choice, Capture One 11 is available for purchase by either perpetual license or by subscription – whichever best suits the customers’ needs. Owners of Capture One Pro 9 and 10 can upgrade for 119 USD/EUR. New customers can purchase Capture One Pro 11 for 299 USD or 279 EUR. Capture One Pro 11 is also available by subscription. Subscribers can simply download the new Capture One Pro 11 release. A single-user subscription is 20 USD/EUR per month for a 12-month plan or a 180 USD/EUR prepaid subscription, paid annually. Owners of Capture One Pro Sony 9 and 10 can upgrade for 69 USD/EUR. New customers can purchase Capture One Pro Sony 11 for 79 USD/EUR. For customers who have purchased Capture One Pro 10 or Capture One Pro Sony 10 since October 31th, 2017, Phase One is offering a grace period, exempting them from the upgrade fee. Eligible customers can download their upgrade today at phaseone.com/download and reuse their license key.